Chalfant Dock/Fan Lightsprovide an atmosphere for improved employee safety and efficiency - because employees are more comfortable, less fatigued from heat and forklift fumes, and has better visibility within the trailer. for effective air circulation. Motor: 1/8th HP. 2.0 amp. • Safety grills front and rear. • Light-only switch (Incandescent & HPS). 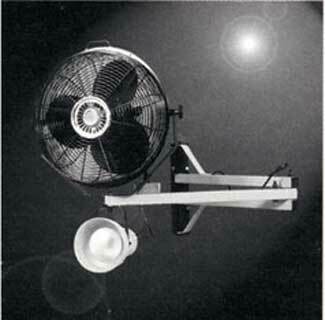 • Fans quickly removed if not in use. Manufactured to industrial standards: Double strut steel arms. • 14 Gauge, 1-1/2” Steel tubing. • Nylon & steel washers. • 3/16” Steel mounting plate. • 18/3 SJT cord set with plug, 4-1/2’. All Chalfant dock fixtures are UL Listed and meet NEC and OSHA general safety requirements. The addition of polycarbonate lens to any of our HPS fixtures makes them safe for food handling and processing areas.